Saturday 02/23/2019 – 12:00 p.m. – 1:30 p.m. or 2:00 p.m. – 3:30 p.m.
How many goats will there be? There will be six goats and 40 people in the class. This ratio is recommended by the instructor/goat owner. The goats are affectionate and like to be around people, and with less than 40 people, one might get a little too much attention! What should I bring to goat yoga? 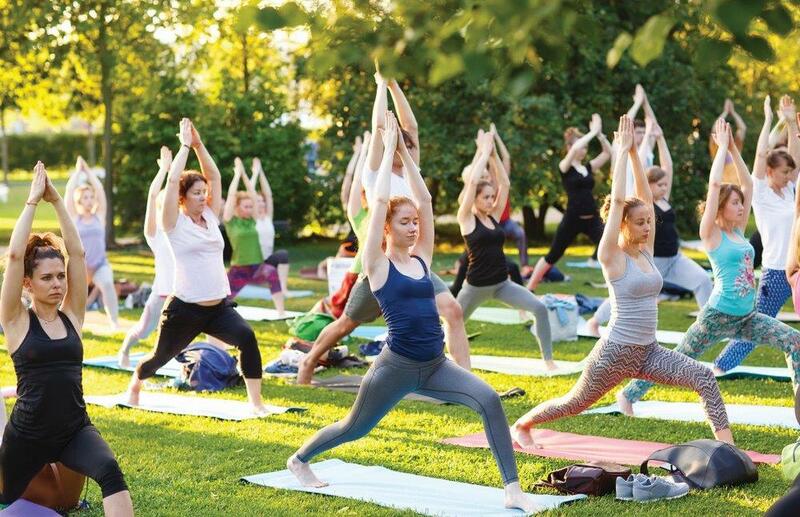 A washable yoga mat, comfy clothes that you are okay with getting dirty, and bottled water. And your phone for great photo opps! What should I wear to goat yoga? Comfortable clothes you can stretch out in and can get dirty! Plus, a top that covers your back. Be sure to remove loose jewelry. What should I expect from the goats? 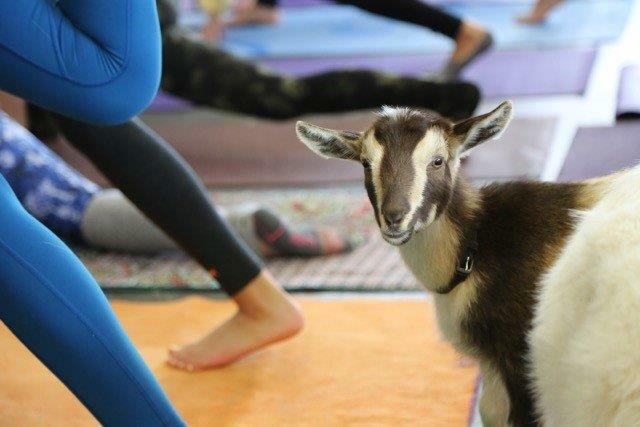 Chances are a goat might sit on your mat, sniff your things and clothing, an even jump on your back while in downward dog! When that happens, most people say it feels like a massage. If you prefer to not have a goat jump on your back, simply sit up when you see them coming towards you! Are the goats potty trained? Nope! But their dry little coffee bean like pellets are virtually odor free. And, we will have disinfectant handy to clean up goat-related messes as they occur. Are your goats rescues? Yes, we have four goats and they are rescues! Our goats have been rescued from dairy farms and a farm destroyed in a 2017 southern California wildfire. Where do the goats live? The Hello Critter goats live in our 1800 sq ft. barnyard, complete with tree stumps, a playhouse, wooden crate & wine barrel to jump and climb on for exercise between frequent walks and outside activities. 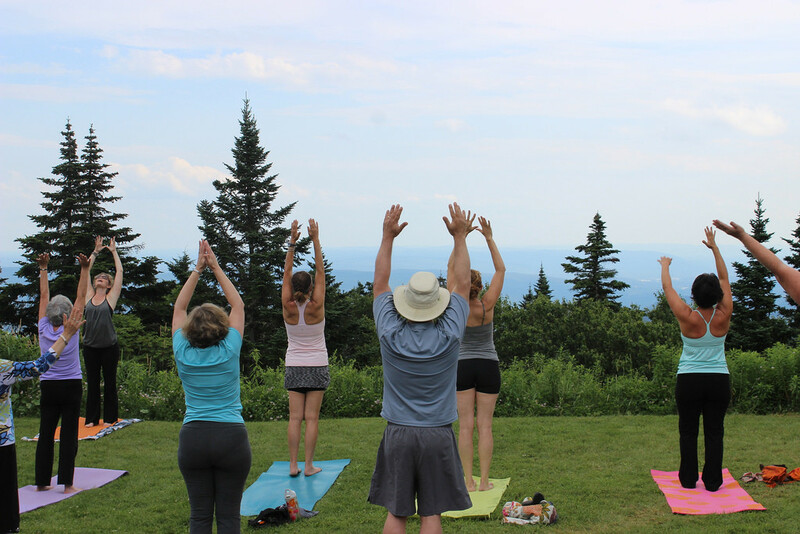 They go offsite for goat yoga, hikes, meet and greets, team building events, fundraisers, parties, creative workshops, media events and to help with brush clearance. They primarily eat Timothy hay. They also enjoy fruits and vegetables and all kinds of foliage and bark from trees. Some of our goats will try their best to eat paper if it is within reach! Do the goats like yoga? Our goats are affectionate and love to be around people. 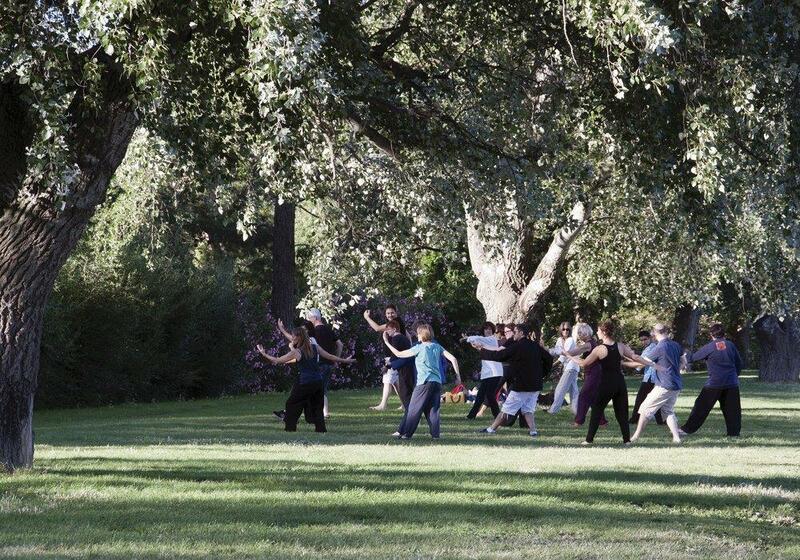 During yoga they roam freely and are not forced to participate. Do I have to do yoga? Of course not! You can sit on your mat and relax, watching goats and laughing with everyone else.